We've seen it on drawings and posters: how unit lengths of superconductor will be "de-spooled," straightened, cleaned, bent , wrapped in insulating tape and finally wound into flat, spiralled coil layers called "double pancakes" to form the building blocks of the ITER magnets. Now, looking down from the observation gallery in the Poloidal Field Coils Winding Facility, it's easier to imagine how drawings will translate into the reality of an industrial process. The coil winding tooling is in place—colour-coded yellow for the moving parts and blue for the static ones. 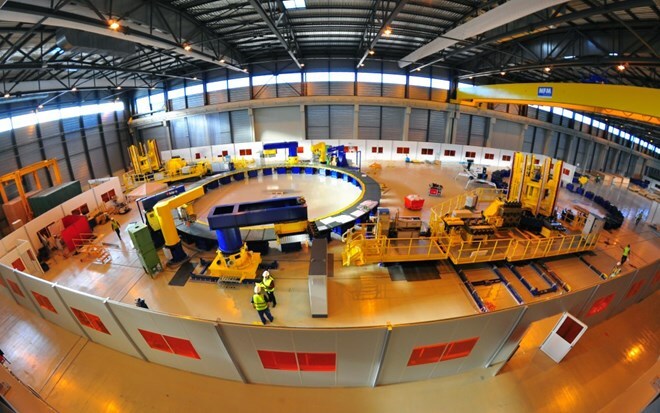 Two tower-like de-spooler structures stand near the winding table (to the left of the photo) that measures 16 metres in diameter; to the right, is a support structure that will be used after the winding operations in preparation for the impregnation phase. The European Domestic Agency plans to beginning winding operations on the first "dummy" poloidal field coil (destined to qualify tooling and processes) this summer.